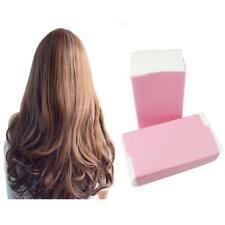 Diy/Professional Perm Special, perm must be coated paper, applicable to any cold perm hot perm Hair Film. Features: Hair Salon professional Perm Curling Tools high-quality Perm Paper/electric hair paper with curling bar use DIY. The exclusive technique of TOSOWOONG allows pressing down the side hair. 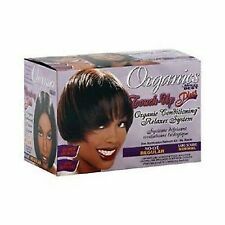 Strongly pressing down for 3 weeks, long lasting self-down perm. Carefully shampoo again to wash out any remaining product. How To Use. Prevent cold perming from uneven perm potion. 1000 pieces of perm paper included, great amount. 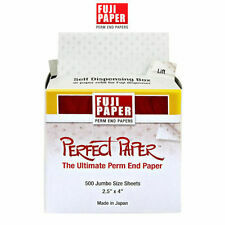 Type: Salon Perm Paper. Used with moderate thickness, convenient and quick curing. Great paper for professional hair coloring use. 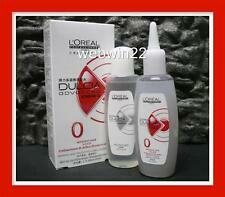 L'OREAL DULCIA Permanent Wave Curl Perm resistant hair. Treating & Protective Long-lasting Perm. - Treating & protective long-lasting perm. APPLICATION OF PERM LOTION. - Rinse out perm lotion thoroughly then blot out excess water. Shiseido Professional launched a perm lotion that adopts the concept of skincare to achieve curls with plenty of bounce & spring. N - Perm Lotion 100ml. - Apply Perm Lotion to hair, leave for 10 to 15 minutes. This 2 step straight permanent system contains smoothing cream & neutralizing cream. Which are permanent solutions that are used with a hot hair iron to make your hair smooth, shinny,straight. Natural-looking straight hair. ◈ Shiseido. How to use : Apply Perm Lotion to wound hair, leave for 10 to 15 minutes, and rinse with water. Leave for 10 to 15 minutes and rinse off. Type : perm. Quantity : Perm Lotion (1pc) Neutralizer (1pc). •m1 for sensitized hair. X2 Schwarzkopf OSiS FLEXWAX Cream hair texture Clay Wax 85ml. H1 2 Shiseido Crystallizing Straight Hair Straightener 400g Neutralizer 400g. •Size : Smoothing Cream(Perm Straightener ) 400 ml. 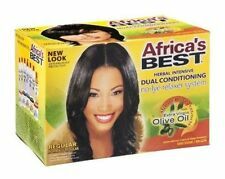 Simply apply the product on the desired part and let it be absorbed by the hair for 10 minutes. The hair on the areas in which the product has been applied will stay straight for three to four weeks. • Hair perm rods in a zip bag. So, give us a try and we are confident that you will be back for more. These options include Our policy at My Beauty and Care is to process and despatch orders within 24 hours to ensure your goods get to you safely and quickly. ◈ Goldwell. Goldwell Topchic Permanent Colour Hair Color Dye 60ml. Hair Type : For difficult to perm natural. Perm-Set : "Type 0 "For difficult to perm natural. Quantity : Price for1 Box (Perm Lotion : 100 ml Neutraliser : 100ml). Aging ( 15 min is standard. depend on hair condition Weak hair 10 Min, Strong hair : 20 min). After shampoo and dry hair. - Effect last for about 1 month. ◈ Goldwell. Goldwell Topchic Permanent Colour Hair Color Dye 60ml. Quantity : Price for1 Box (Perm Lotion : 100 ml Neutraliser : 100ml). Hair Type : For porous, colored hair. Perm-Set : "Type 2 "For porous, colored hair. Straightening Cream & Neutralizer. - Straightening Cream Intense - 100 ml. STRAIGHTEN IT. - Comb through just once & carefully with a large-toothed comb. INTENSE N/R. - Comb the hair straight & allow the Neutralizing Emulsion to take effect for 10 minutes. Shiseido Professional launched a perm lotion that adopts the concept of skincare to achieve curls with plenty of bounce & spring. H - Perm Lotion 100ml. - Apply Perm Lotion to hair, leave for 10 to 15 minutes. Model : E. GLAM DOWN PERM. Roll hair with the enclosed hair roll, fix with a pin, and leave it on for 10-15 minutes. Hair Roll - 2pcs. Hair Pin - 2pcs. Wear gloves and place the film on the forehead. Film - 1pcs. Arrange the bangs in a triangular shape and evenly apply solution 1. Graham TrueWave End Paper Hair Perm Styling Dispense 1000 Papers Jumbo 4" x 2.5"
Perm End Papers. Jumbo Size: 4" x 2.5". Hair Type All Hair Types. Very Absorbent with High Wet Strength. ◈ Goldwell. Goldwell Topchic Permanent Colour Hair Color Dye 60ml. Capacity: ( Perm Lotion 80 ml Neutraliser 100ml inter-Fluid 30ml ). Wella Koleston Perfect Permanent Hair Dye 60g - Special Blonde Series. Straightening Cream & Neutralizer. - Straightening Cream Mild - 100 ml. STRAIGHTEN IT. - Comb through just once & carefully with a large-toothed comb. - Comb the hair straight & allow the Neutralizing Emulsion to take effect for 10 minutes. ◈ Goldwell. Goldwell Topchic Permanent Colour Hair Color Dye 60ml. Quantity : Price for1 Box (Perm Lotion : 80 ml Neutraliser : 100ml). Wella Koleston Perfect Permanent Hair Dye 60g - Special Blonde Series. 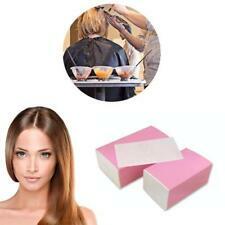 Perm 120ml, Brush and comb for the perm(1EA), Perm Paper(10EA), and Latex Gloves(1EA). Down Perm is naturally pressed a man's side hair. - Floating Side hair, which naturally makes trim the difference should not trim hair one step hair down perm. 1 1 =2EA ( special price ). The clean and relieve the itching, hair and scalp. Made in Korea. Healthy hair smooth without irritation by conditioning the hair Protect hair from external aggressions and gives shine and elasticity. ( Black Moster Down Perm Products contains Down Perm 120ml, Brush and comb for the perm(1EA). Black Monster down perm presents a strong down perm effect on your side hairs without any irritation. Perm Paper(10EA), and Latex Gloves(1EA ). ). ◈ Goldwell. Goldwell Topchic Permanent Colour Hair Color Dye 60ml. Quantity : Price for1 Box (Perm Lotion : 100 ml Neutraliser : 100ml). Wella Koleston Perfect Permanent Hair Dye 60g - Rich Naturals Series.